With our long passages and passionate desire to avoid spending money, free mind candy is a necessity. Podcasting offers a way to get your content when you want it, how you want it. Use iTunes to manage your podcast subscriptions and download all that stuff with a single click. Did I mention that it costs money? I hate paying for anything I can get for free. And with the Internet the way it is today, you can get more free content, LEGALLY, today than you could two decades ago commercially. I repeat legally, because while I can tell you all sorts of things about how to get illegal content like the latest movie release or Cold Play album, I don't do it. Seriously. I make a living distributing Creative Commons licensed content on the Internet and I don't steal. But mostly, I don't steal because I don't need to. People all over the world are putting together great shows – audio and video – that you can download to your laptop computer for free. These distributions go by a variety of names: podcasting, netcasting, RSS feeds. All you really need to know at this point is iTunes. iTunes is an application distributed by Apple, Inc. to support its infamously prolific iPods. You can download iTunes for free from Apple. It doesn't require the purchase of an Apple product, and it is available for both Windows and Mac devices. The instructions to install this software are straightforward. If you want to purchase any content from Apple, make sure that you set yourself up with an Apple account during the installation process. This article really isn't about iTunes, however. iTunes is just the first – and probably the easiest – of applications that let you gather your podcast subscriptions in one place and download them automagically. This article is about the podcasts themselves. Now let me repeat this important bit of information: just because we call them podcasts does NOT mean you need an iPod. Podcasts are music or video files regularly distributed by some artist or news organization. In fact, podcasts are free music or video files regularly distributed by nobodies like you and me as well as luminaries like National Public Radio. 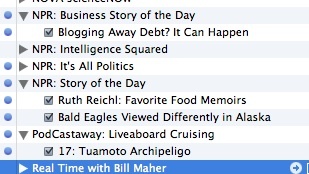 A quick peek at my own iTunes podcast subscription list shows some of the variety of content available. You can subscribe to music channels, news, humor, even books on tape. To get you sailors out there started, I recommend the following sailing-related podcasts as a place to start your free media consumption: PodcastAway, from the catamaran Dos Gatos currently sailing in the Pacific, and Distant Shores hosted by sailing authors Paul and Sheryl Shard. If you are a news junky and miss your daily fix, cruise the NPR feeds. They break them down by topic: business, technology, environment. I enjoy getting the weekend shows such as the Lake Woebegone stories of Prairie Home Companion and This American Life. Those traveling with children MUST subscribe to WNYC's Radio Lab and the Best of YouTube. 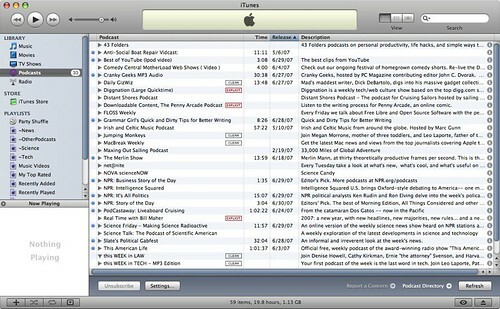 iTunes tracks which podcasts have been downloaded and which have been read. When you shlep your laptop to an Internet cafe or locate the nearest WiFi hotspot, fire up iTunes. It will check the podcast providers, download all the new episodes, and delete all the ones you have listened to. This may take some time, but it can run while you are busy with other Internet chores such as posting your photos or sending email to your family back home. After you disconnect, you will motor back to your sailing home, your laptop full of entertaining goodness for the next long spell in the middle of beautiful nowhere. Another good open source/cross platform podcast client is Juice (http://juicereceiver.sourceforge.net/).